War has erupted on the lonely planet of Ishtonia IV. Humans and a sentient, mechanical alien race known as the Zali – former collaborators in the mining and processing of the rare compound, Lohum – now see each other as threats to their continued existence on the planet both had so tenuously shared. Guide reluctant Overseer Oliver Petrovich and Rebel leader Aeryn Ozarr through the campaign where they witness the war breakout and fight their way through the madness to try and understand the cause of the sudden hostilities. What both have yet to realize is that they’re witnessing history, creating it, and somewhere down the line a tryst with destiny awaits. Or else, wade into multiplayer as either the Ishtonian Alliance or the Zali, fighting for control over resources while trying to outwit your opponent and survive the worst Ishtonia can throw at you. Supports upto 8 players with score tracking. Both Single and Multi-player feature choices that aren’t always obvious at first but can still affect gameplay down the line. 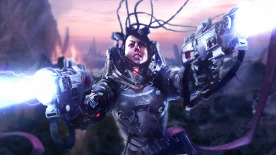 Every unit in Tryst comes with its own unique set of abilities and upgrades to choose from. Don’t let the maps fool you… They’re not just playing fields. They’ll take every opportunity to strike back at you. You don’t have to worry about player who go offline or have to leave in the middle of a game. They’ll be replaced with competent AI immediately. For multiplayer, while choices do bear consequences, both good and bad, there is always a chance for a comeback. How? See feature 1! State of the art visuals powered by the UNIGINE engine.